Check the original post for the full details. LinuxSampler is an odd beast — it can be tricky to install, and confusing to configure, but it’s undoubtedly the best tool for working with large sampled instruments under Linux. With its next release adding support for the increasingly popular SFZ format, and the fact that it’s one of the few LV2 synth plugins ready for use with Ardour 3, I think it’s about to get a lot more important. Let’s not get too far ahead of ourselves, though. What exactly is LinuxSampler, what’s it useful for, and perhaps most importantly, how do we use it? 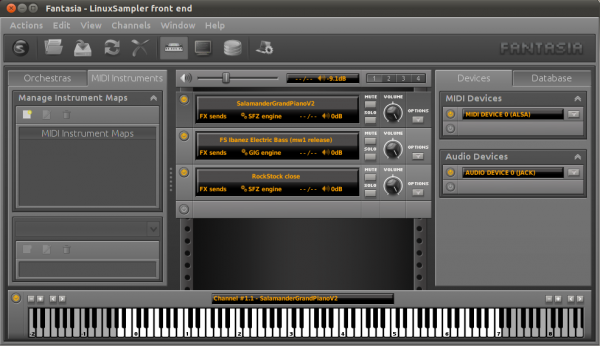 LinuxSampler is a sample-based synth that lets you use very large sampled instruments. Rather than loading the entire instrument in to RAM, LinuxSampler loads just the start of each sample, and then reads the rest from disk as it’s needed. Because of this, it can load instruments much larger than your system would be able to handle with other software, such as Hydrogen or Fluidsynth/Qsynth. Realistic piano sounds are perhaps the classic use for LinuxSampler — a good piano, like the Salamander Grand Piano, can reach 2GB or more in size — but it works just as well for electric pianos, guitars, violins, trumpets, drum kits (a personal favourite), or any other instrument that calls for large samples, or a lot of samples, to provide a realistic result. LinuxSampler can be run standalone — it supports ALSA and JACK for both MIDI input and audio output, and can handle an arbitrary number of inputs and outputs mapped to different instruments. It can also run as a plugin; the LV2 plugin runs well under both Ardour 3 and Qtractor. The inspiration for LinuxSampler was a Windows app called Gigasampler, which was the first sampler to incorporate on-demand streaming of sample data. It’s a standard feature in professional samplers today, and Gigasampler itself has been defunct for some time, but its legacy lives on in the “.gig” file format, which is also LinuxSampler’s primary file format. You can still find some great commercial sample libraries in .gig format, but it’s definitely falling out of favour today. To address that, the development branch of LinuxSampler has added support for a new format called SFZ. It’s a young format, but it’s growing in popularity thanks to the availability of free SFZ plugins across all platforms. Also, because of its design (the SFZ file itself is a simple text file, separate from the actual sample data), you can download third-party SFZ mappings for some commercial instruments. Even though .gig is fading away commercially, it’s still useful for bundling your own sounds. 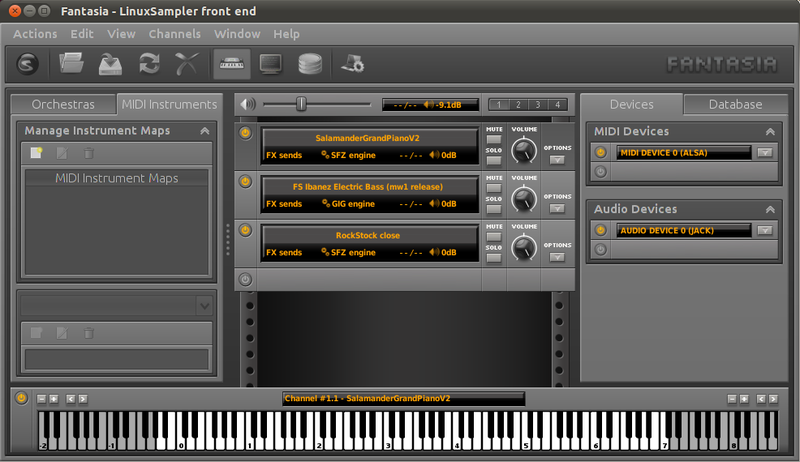 The LinuxSampler project includes a .gig editor called “gigedit”, which you can use to create your own instruments. Hopefully you now have an idea of what LinuxSampler is and what it can do for you. Now all that remains is to learn how to install and configure it! I’ve customised the theme to slim down the header area and expand the content area a little, and it’s entirely possible that I’ve broken something in the process, so if you notice anything odd, please let me know.